One of the unique qualities of Raven's Retreat is that, unlike some other shepherds huts, you have your own bathroom attached via the veranda - so no getting wet. 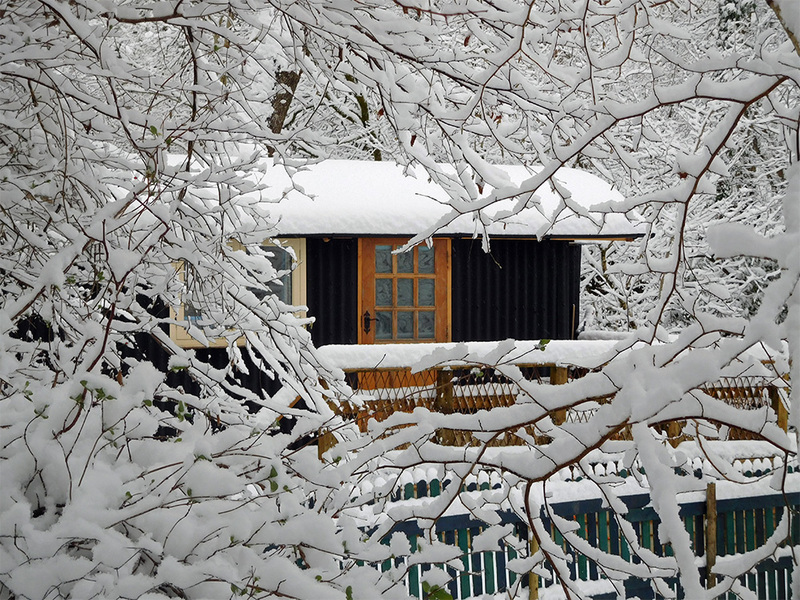 The Hut is well insulated and has a log burning stove to keep you warm even in winter. Logs and kindling are provided and the fire will be lit for you if you wish to arrive toasty warm. There is a pull out double bed and space for a single mattress. The bathroom has a Villa compost toilet (odourless) a shower/bath and heated towel rail. The kitchen area contains a microwave/grill, fridge, toaster, hob and kettle. The hut is situated off a quiet lane and there is car parking for two vehicles. WIFI is provided, but as there is no mobile signal we can lend you a pair of walkie-talkies to keep in touch. There's an enclosed garden to keep the dog safe and a large play area (not presently fenced) which could also be used for a tent. There's a kennel and run at the house where we can keep an eye on your dog(s) if you want a day away. A continental style breakfast hamper with a choice of menus can be delivered to your door. If you are interested or want more details please do feel free to contact us and we look forward to welcoming you to the "glamping" experience at Raven's Retreat.